"The Shaolin followed a training regiment of unparalled severity; a regiment with oneobjective, to create a warrior whose resolve no agressor could disturb." Kung Fu and other Chinese fighting disciplines (especially Shaolin) have enjoyed immense popularity in the world primarily through films, both fictional and otherwise. Education about the history and nature of these arts is, however, something not often provided, and when it is, it's often mixed with theatrics that tends to enhance it to fiction. The documentary, Secrets Of The Warriors Power: Kung Fu, created and directed by martial artist Jim Grapek, seeks to bridge that gap. It provides an informative, basic history of the evolution of Chinese fighting arts, but does away with the exaggerated mysticism that often clouds the true story. Featuring the participation of true masters, the film is lent authenticity not often seen in programs on this subject. 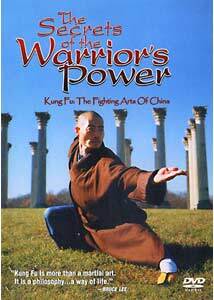 Secrets of the Warriors Power tells the story of how Chinese Kung-Fu fighting arts essentially were given birth to in the Buddhist temples scattered around the country, most notably, the temple of Shaolin, where the most focused and deadly of these skills were created. The film does a good job of explaining how political turmoil basically gave rise to the need for such a physical fighting style. For Buddhist monks to be able to protect themselves in their isolated temples against any number of foes, including the government itself, they had to develop techniques and training. By applying Buddhist philosophies of mental strengthening to their own bodies, the monks were able to turn themselves into virtually invulnerable opponents, able to defend themselves against many types of enemies and weaponry. The ritual behind this became a large part of standard Buddhist religious practices. Unfortunately, successive Chinese governments grew more and more fearful of the monks; often the only people capable of standing up to the military. For decades, kung-fu was assaulted and, at one point, even outlawed in Chinaand once the 1960s cultural revolution came along, it was all but extinct. This documentary wisely credits the revival of the Chinese martial arts afterward to the filmmaking industry of Hong Kong, and the legendary Shaw Brothers studios whose series of films depicting both fictional and historical battles of kung-fu fighting were extremely popular. While this kind of "theatrical" kung-fu was looked down upon by those skilled in the true art, it certainly brought back interest in it resulting in the opening of new fighting arts schools. Perhaps no figure is more instrumental in bringing this to the Western world than that of Bruce Lee, whose personality and films made kung-fu a household term. This documentary does a good job, in only 50 minutes, of condensing the story of this evolution to present day, mass media acceptance of Chinese fighting arts. By using contributions from people like Pan Qing Fu, one of the greatest modern martial arts figures, the film maintains credibility. I'm by no means an expert on martial arts, but I have known enough true-devotees to the art as well as read some material on it that I can usually spot when a show is, to put it simply, garbage. This was obviously meant as an educational piece, that shows that studying martial arts (whether it be Shaolin style, or Japanese forms) is not about focusing on violence and should not. While there is still an air of mystical grace to the abilities of the Shaolin monks and modern day keepers of such wisdom, Secrets of the Warriors Power doesn't overdo it. It's level-headed, and doesn't fill the entire running length with nothing but footage of masters doing things like breaking walls and such. Even mention of the legendary Dim Mak (a technique known in many fighting circles, supposedly disrupting internal organs by way of focusing chi energy) is treated without going out of hand trying to make it seem either hard fact or airy fiction. In fact, this show makes a great introduction to the history needed to understand the complex and ancient plots behind a lot of Chinese action films, especially those set during the Boxer period or those dynasties that attempted to wipe out fighting schools. There is little to complain about in this finely produced, informative work, obviously made by those who appreciate what they're discussing. Image Transfer Review: The image quality varies a lot because of the different sources being used. Overall, the transfer is satisfactory, but much of the footage that is not interview-based is rather hazy and dark, sometimes with visible artifacts. There is little to complain about, but isn't totally solid all the way through. Audio Transfer Review: The stereo soundtrack does it's job with no major events. The musical score and heavy narration are clearly distinguished from each other. Nothing is distorted or hard to hear, and there are generally no problems. Extras Review: Some surprising extras adorn the disc, starting with interviews with Pan Qing Fu andDennis Brown, two very esteemed instructors in the martial arts world. They areinteresting and informative, providing some insight into each persons respective dojo. Unfortunately, subtitles would have helped in the Pan Qing Fu interview as his heavy Chinese accent makes him hard to understand to the untrained ear. There is also an interview with Jim Grapek, the brains behind the documentary, in which he tells of his goals with what he wanted to accomplish in the film. There is a reel of footage featuring more feats of incredible strength by masters of Chi Gong (the ability to channel internal energy into certain parts of the body), but be forewarned, it can get a little extreme for the faint of heart. There is no violence, but it's quite intense. As a primer into the world of Chinese kung-fu, Secrets Of The Warriors Power earns good points and a solid look at the world of highly rigorous, intense physical training as associated with fighting ability. Definitely a good idea for those wanting to dip their toes behind the realm of Hong Kong, kung-fu cinema.